Design and print just about anything. Supports all label and card stock from Avery® and other manufacturers and allow you to create designs from templates or starting from scratch (blank). 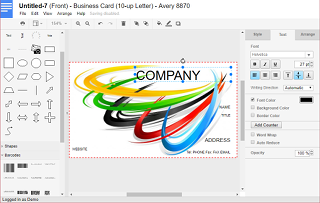 Add your own pictures, text, lines, shapes, counters, barcodes and more. Works on any device with a modern browser. Windows, Mac, iOS, iPad, Android, Linux, Chromebook and more. No installation. Use from anywhere simply by logging in. Always up to date. Never any updates to install. For those who prefer traditional desktop software or need more advanced database support, please see our Windows desktop based Design & Print products. Copyright © 2019 CAM Development. All rights reserved. This app is currently in BETA testing. You can create an account and use the free version without warranty of any kind.